He may be gone in the physical sense, but there is no doubt in my mind that Mr. Jazz is still with me…. Last night after dinner I was in my office catching up on things – no surprise there. I try to make use of my time as best I can and I was putting together some materials for my upcoming trip I will be taking to the Global Pet Expo in Orlando. I have never been to this event, but since it’s close to home and won’t break the bank, I thought it would be a great opportunity to meet some new people, catch up with friends, and learn about all the coolest cat products and trends that are on the market to share on Zee & Zoey’s blog. Dan will be coming with me for the first time and it will be nice to venture out with him instead of leaving him home with the cats. My oldest son who turns 30 today (sigh) will be cat-sitting, so there you have it. What made last night more unique was my visitor. Please don’t think I’m crazy, but ever since Mr. Jazz crossed the Rainbow Bridge last August, sometimes I see him in the house. Mostly it’s when I’m on the couch watching TV – I will catch a glimpse of him down the hallway as if he’s getting ready to lie on my chest like he had done a thousand times before, and sometimes I feel him lying on top of my legs in the bedroom at night. As time has gone by, my visions of him have lessened significantly – I don’t know if he felt I needed him and he hadn’t quite crossed the Bridge because he wasn’t ready to leave me, or if it is him in some spiritual and ghostly sense, perhaps with some lesson he is trying to teach me. I just don’t know yet, but I don’t question it and it doesn’t scare me. I do see him and it brings me comfort to have him with me, so that is that. This is Rolz at any given moment when I am on the computer. I will glance over at him and he will just be standing guard, staring diligently at me until I call it a night! Last night, however, he came into the doorway of my office for the first time. I was sitting on the floor with some papers and Rolz was beside me, quietly supervising. Rolz is an eternally patient cat and will sit on the floor every night until I am ready to call it quits to go watch TV. Usually I’m on the computer, but this time I was on the floor with Rolz, facing the door, and that’s when I caught a glimpse of Jazz. I didn’t give it much thought and about an hour later I went to sit on the couch. This time Jazz came with me and when I settled in, I could feel the weight of his body on my chest like he had done with me every night in the past when he was alive. I can assure you there was no doubt he knew I needed him. I had been experiencing an emotional unbalance that night and he was trying to help me find my center. 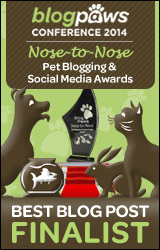 I felt myself take a deep breath and after that I randomly picked up my iPhone and saw a notification on Facebook from BlogPaws – the blog post I had submitted to Blog Paws for the Nose-to-Nose Social Media Awards had been selected as a finalist. The post I submitted for consideration – the tribute I had written to Mr. Jazz after he died. Somehow he must have known it was coming and wanted to share the moment with me. I just don’t know. It’s such a bittersweet blur of emotion and all I know for sure is that I am truly humbled it was selected. The outpouring of love and support I received from that post still moves me to this day and Jazz remains forever in my heart, my feline muse, friend, and inspiration. So much so that I have begun to write his story and hope to have a book in the near future. I have the outline of the book done but as you can imagine, it isn’t so easy to write. First off, because I had to let him go all over again, reliving it through words, and also because the story is being written from the viewpoint of Jazz himself, so I have to write as I imagine he would think. I think perhaps that has been the message all along – Jazz wants his story told, not to make people sad, but as a story of joy and celebration of the moments we do have with the animals we love. Just like the post I wrote to him that was aptly titled, “A Tribute to Mr. Jazz – The Dignity of Life and Death and Finding the Beauty in Letting Go,” the story will reflect a cat that lived a long, happy, and content life. What about you? Have any of you had a pet that stayed with you from the beyond? I would enjoy hearing your stories if you wish to share them. *wipes tears* First off….CONGRATULATIONS on your nomination Deb, so very deserved!! Today’s post proves what an amazing writer you are! I’ve not experienced this with my cats but with my brother….exactly as you described….feeling his presence, seeing “signs”…just KNOWING that he is still with me…though his visits have lessened with time, I know that he will always be with me. I do think when we loose someone so precious to us that they linger on…in our hearts, minds and souls until we pass, and then we can be that comfort to those that need us. Again, Mr. Jazz’s story…award winning!! 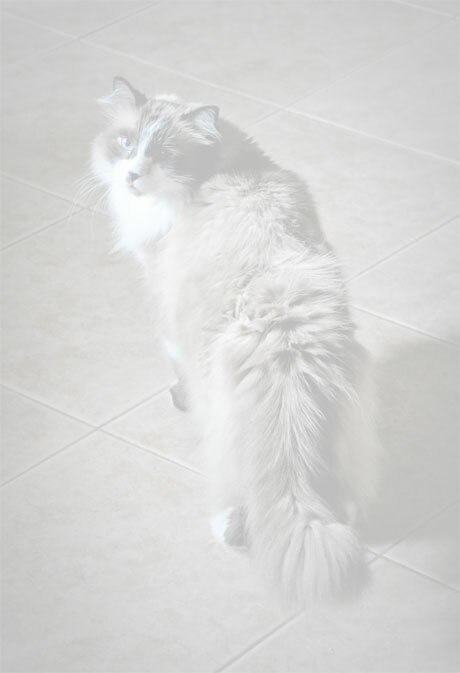 Deb as always, superb…………..I believe that Jazz is with you EVERY DAY….our “soul kitties” never leave us…………..I know this, because my Angel Bobo often makes his presence known. Too many times to list here. Deb, Congratulations!! You really have such a moving way with words. Always. You deserve this award, I’ve heard my Great Grandma after my son was born, seen my lost dogs in the back yard. My last one “talked” to me from his grave. Felt the presense of lost cats. I think they know when we need them and can cross back and forth. You are so lucky to have Mr. Jazz come back to you. My son can see, I think it is amazing to have that link. You and Dan have a blast at the conference, looking forward to hearing and seeing about your trip. And the new goodies coming up. I also have some tears, but wanted to offer congratulations. I experienced visions of Sweet Praline for several months after she crossed the bridge. I could feel her soft fur brushing by my legs when I was on the computer, and one one night when I was extremely depressed, I looked over at the wall at the corner of the hallway where she would always stop and look at me and there she was, as clear as day. These encounters always brought me such comfort. I haven’t sensed her presence as much since Truffle and Brulee have arrived, but the pet psychic told me that Sweet Praline had been in constant contact with Truffle. Yes, I felt my kitty Pecheecho’s presence for a long time. I feel like Pecheecho led me to find the look alike kitty that needed rescuing just a few weeks after he passed. For the longest time, this look alike kitty was shy and not affectionate and seemed to have Post traumatic stress disorder from her year long stay at an animal shelter. I would often write to Pecheecho, as in writing letters as Id learned to do from the site Letters to Pushkin. Once I wrote how much I missed him and that when my new kitty started to sleep on top of me and wrap her body around my neck and face, Id know Pecheeho taught her to do this. Well, now she does all of this. I feel Pecheecho guiding my new kitty and I feel his presence. I feel him more than I see him and I feel his presence guiding the kitty he sent to take care of him. My new kitty, who’s name is Jazzmine and is actually called Jazz or Jazzy, is 10 years old and I want to spend time honoring her and loving her before her time is up as well. Ive started spending more time loving her and less time writing to Pecheecho, but I still think of Pecheecho every day. When I read the letters ive written him or read my Pecheecho journal, I still cry uncontrollably. I’ll never get that part of my life that I shared with him back. I’ll probably never have another cat from kittenhood to 16 year old adulthood again. Even if I do, I wont b a young person, moving around w a dysfunctional life for my poor cat to nurture me thru. Pecheecho actually came to me as a result of a dysfunctional young adult relationship. He represented all of my dysfunctional 20’s, my pathetic 30s and my getting my sh%t together 40s. Pecheeho will always be the most significant cat of my life. Well, congrats on your award. You and Mr Jazz have helped so many work thru their grief at losing a significant loved one. Rhonda – I like that you use letters as a way to communicate and share your feelings. It is a healthy way to channel grief and can help to keep those we love and miss closer to our hearts. It is hard though… I have been a basket case on many occasion writing Jazz’s book – crying uncontrollably, but I still feel in the long run it is the right thing to do. His story is important and I want it to help others work through their own grief at losing a beloved pet. Thank you for sharing all of your experiences – I appreciate you doing that. First, congrats on the nomination, we can’t think of anything better! Second, we don’t think you are nuts at all. My Dad and I get visits from my late Brother Ivan quite frequently, and that is just as it should be. Congratulations on the nomination, Deb. I truly understand what it is like to lose a beloved cat. I lost Nubie suddenly when he was 10. I had rescued him from a shelter when he was 3 months old! I never understood grieving the loss of an animal until him. I think it is wonderful that you get visits from Jazz. I sensed Nubie’s presence, but I never saw him. It wasn’t until I adopted Sophie that I truly stopped crying whenever I thought of Nubie. Thank you Moggiepurrs – I actually do feel peace. I know Jazz is no longer suffering and he lived a long and happy life. He knew nothing but love and that gives me great comfort. I am glad you have Sophie in your life and thank your for the congratulations! Congratulations, Deb. What a wonderful tribute to your beloved Mr. Jazz. I have no doubt he is with you. This is a very special nomination indeed. My apologies for not including you immediately in the CWA post but so glad about your well-deserved nom. Jazz is around no doubt to help you write your book just as Gris Gris is around to help me write my book on pet loss. My research study on pet loss is showing a high incidence of after death visitations so you’re in good company! No problem Layla – I know it was not intentional! I believe Jazz and Gris Gris are in cahoots, somehow cheering us on to write! I look forward to your book and am sure it will be quite enlightening. Wonderful news! Congratulations on a wonderful post being recognized!! We’re so very happy for you! Thank you so much Maxwell, Faraday, & Allie!! We know that cats don’t really leave. Iggy Cat never sat on the woman or anything but he did leave her a message on the computer–she had stopped doing the click a day for Feed the Animals for about six months and the Monday after he died, she decided to do that. there was a big orange cat with a disgusted expression on his face (much like his) and behind him was something that made it look like he had a halo. No matter what when she clicked, that picture showed up. She told people and no one else EVER got that image no matter how often they clicked, but at her house, that always showed up and nothing else. I have no doubt he appeared to celebrate with you. Those moments of emotional imbalance come and go but a feline’s love is forever, even after they are gone. Congratulations and best of luck in Nose to Nose, and have a great time at Global Pet Expo! I agree with you Bernadette – thank you for the congratulations and back at you for being nominated for Best Cat Blog!! Awesome news! Deb, I am so delighted to hear of your nomination! ConCATulations. And, the perfect post to receive recognition. Like you, I’ve had many kitties throughout my life. Not one of them is forgotten, nor crossed that bridge without a river of tears accompanying and following their journey. I’ve had visitations and sighting exactly as you’ve described from each of them, in their own, special voice. Of particular note is my Siamese kitty, Pye. She was the Queen of our household. I would wake up from a deep sleep after feeling her jump onto my bed and curl up at my feet, or walk onto my chest to snuggle. Only to find that she wasn’t there. I have no doubt she was indeed there, in spirit form, to remind me that love extends beyond this plane. She’s gone 22 years now, and I can still catch glimpses of her even though the spaces we occupied together are no longer home for me. I could wax on about the other cats and their visits~but mostly what I want to offer is my belief that Mr. Jazz dropped by to celebrate with you and warm your heart for sharing your story–the story of that special bond that only the two of you can author. I think he’s nuding you toward the book. Because someone else out there who is suffering and feeling the weight of their loss needs you! Laura – how incredible that after 22 years you still catch a glimpse of your Pye. I too have felt the presence of many other pets that have crossed the Bridge, but none of them with such intensity as Mr. Jazz. Thank you for sharing your story and for your support. Thank you so much Island Cats! Congrats Deb. I had tears too. After my house fire and we got into a new house. I had lost a soul kitty in the fire. I could feel him rubbing against my legs from time to time. And I think I see Squeaky out of the corner of my eye sometimes(like a shadow). The other kitties are asleep. Oh gosh Sue… my heart goes out to you… such a difficult situation for you to deal with. I am glad that your soul kitty is able to reach out to you from time to time. TW is convinced that Nicky is still in our condo. She even has a photo of me with a strange orb. When I don’t sleep with her at night, she feels something climb into bed with her. She thinks it’s me but when she looks, there is no one there. The other night I was sleeping with her when I suddenly jumped up toward her. She thought I was attacking her. Then I climbed back into bed and it happened again. She locked me out of the room. It wasn’t until the next morning when she realized that Nicky probably scared me. I have no doubt that Jazz is still with you, Deb. My heart angel cat Graphite still visits every so often! Thank you meowmeowmans and I am happy to know your angel cat Graphite still visits with you! 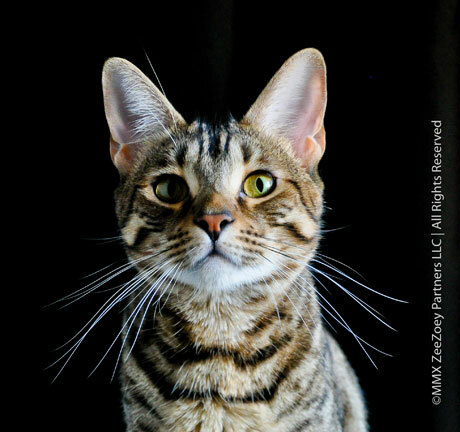 da tabbies… I owe you a huge thank you – I know you have a special fondness for Mr. Jazz and that the tribute post meant a lot to you… thank you, thank you, thank you! Congratulations on being a finalist. Your tribute post for Jazz was so beautiful and is a very worthy finalist. I know Jazz wanted to be with you as I also know that Eric visits me when I am feeling down. Oh Deb. No tears here! I believe you saw Jazz and I’m happy you had that special moment. My beloved Pepe Francois has appeared in a couple of dreams with a message. Can’t remember now but it was comforting that we are still connected. That my “guardian angel” is still watching over me in heaven as he did on earth. Congratulations on your nomination!! Your depth and talent for writing is uplifting, enlightening and worthy of many awards! You’re going to need a digital studio to collect all these awards! It won’t be the same without you at BlogPaws, my roomie, my friend. Thank you for sharing your Pepe Francois story Christine and for the generous congratulations. I send them right back to you and am so happy and excited for your TWO nominations!!!!!!!!!!!! Wow… you have come so far and I am so proud of you! I will miss you terribly and am keeping my paws crossed for a miracle!